Selecting a quality bed for a dog that’s still house training can be difficult. 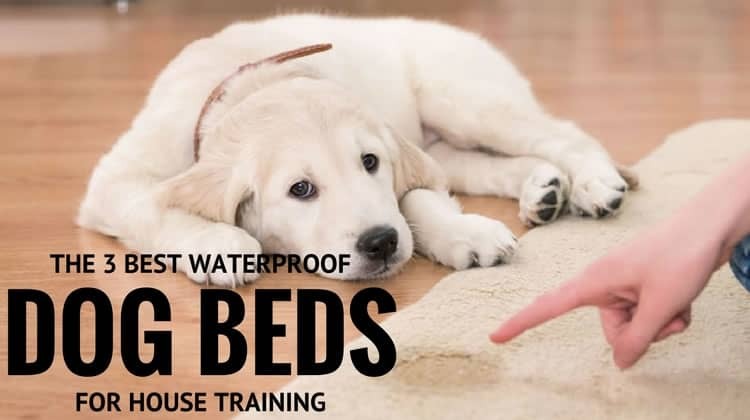 Owners will want a bed that is waterproof, orthopedic, and durable enough to last through house training and well into the dog’s life, from puppy to adulthood. These three waterproof orthopedic dog beds are perfect for house training. Each was selected for its ability to handle accidents and other liquids, support a dog’s weight over time, and the removable cover. 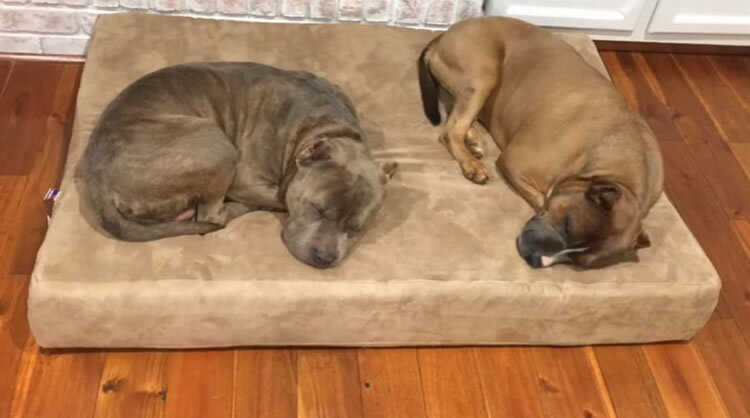 It may be difficult to choose a quality dog bed while still working through the house training phase, but these beds will not disappoint and are the best in terms of orthopedic support and ability to withstand accidents. 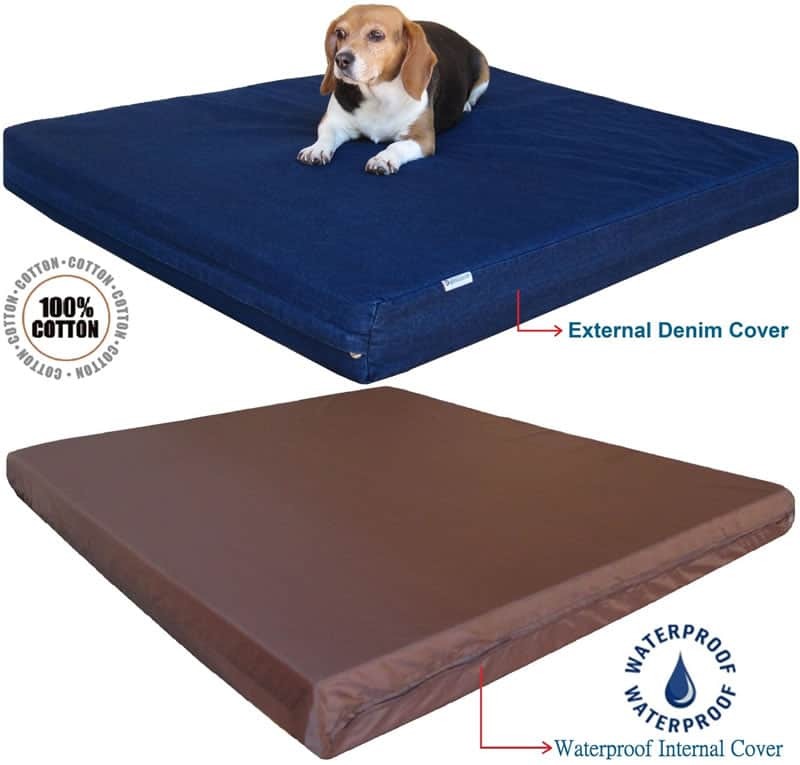 The Brindle 4 inch Solid Memory Foam Orthopedic Dog Bed is a flat pillow style bed complete with a waterproof encasement cover. The memory foam core is four inches tall with two inches of comfort memory foam and two inches of high-density support foam. Foam cores with this structure are the most supportive because the support foam cushions the dog’s full weight and the comfort foam cradles the body, relieving pressure points and tired joints. The cover is made of soft velour and it is fully removable and machine washable. This bed also comes with a 3-year warranty and is naturally hypoallergenic as well as resistant to dust mites. Small: 22” x 16” x 4”, for dogs up to 25 lbs. Medium: 34” x 22” x 4”, for dogs up to 50 lbs. Large: 46” x 28” x 4”, for dogs up to 75 lbs. 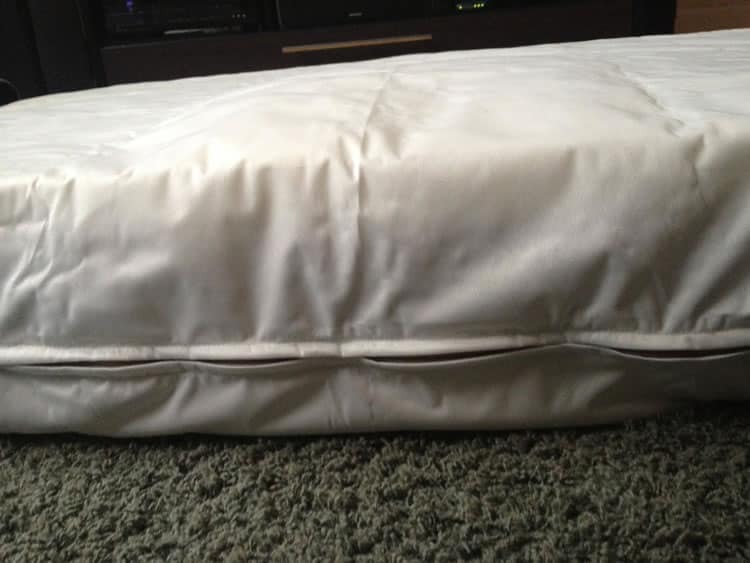 The Dogbed4less Orthopedic Memory Foam Dog Bed is a flat mat style dog bed with two covers, a waterproof inner cover to protect the foam core, and an outer fabric cover to keep your dog comfortable. The core is a solid memory foam pad that doesn’t lose its shape with repeated use. The foam conforms to the dog’s body, making this a very supportive option for those with hip or joint issues. This bed is offered in a variety of bed sizes, cover fabrics, and colors, allowing you to personalize the bed for its space, whether the location is a crate, kennel, or living area. Beds are offered in a variety of sizes, some of which may fit into a standard kennel or crate. Measure the location the bed will reside in before purchasing to ensure a good fit. All beds have a 4-inch height from the ground due to the foam core. To find the correct size bed for your dog, measure your pet while lying down from the tip of the nose to the end of the tail, then add 5 inches to that measurement. The Big Barker 7” Pillow Top Orthopedic Dog Bed (Headrest Edition) is a pillow style bed with a built-in bolstered headrest, designed solely for larger dogs. The foam core is American made and is of the highest quality orthopedic foam, meaning it won’t flatten over time. The foam makeup is two layers of comfort foam sandwiching a support foam center, which prevents the dog from sinking and helps the dog feel cradled and supported. 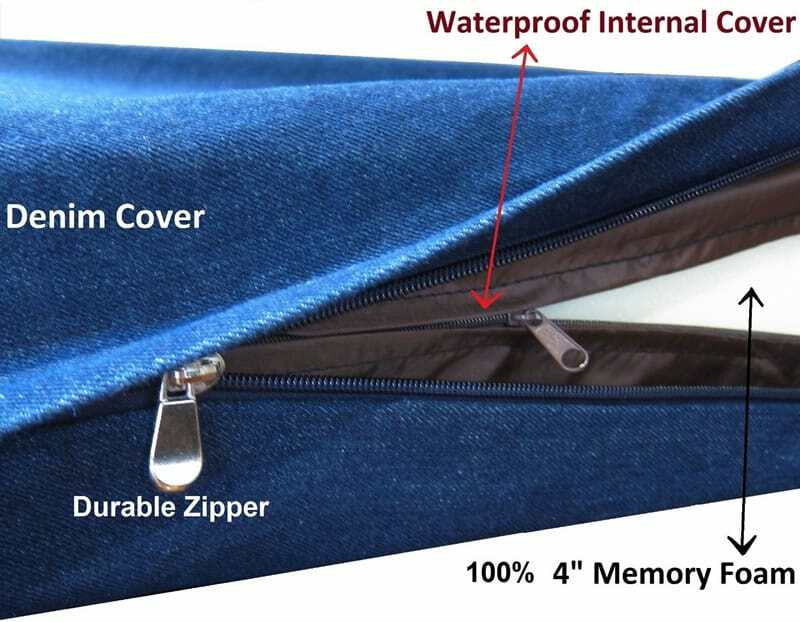 The 100% microfiber cover is fully removable and washable, which makes it easy to clean if it gets dirty or messy. The cover is not waterproof but a waterproof liner cover is available separately to keep the foam dry with daily use. 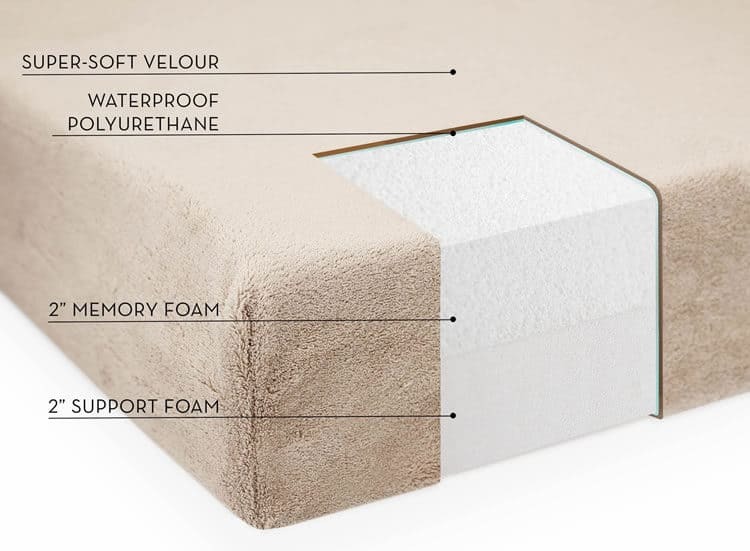 The bed also comes with a 10-year guarantee that the foam will retain 90% of its original shape and support for ten years, or your money back.